Iran’s Islamic Republic News Agency posted this picture from the scene of the attack in Ahvaz. A team of gunmen assaulted a military parade in Ahvaz, a city in southwestern Iran, earlier today. Initial reports by Iranian state media indicate that two dozen people, including members of Iran’s Islamic Revolutionary Guard Corps (IRGC) and civilians, were killed. The Islamic State claimed responsibility for the shootings via its Amaq News Agency. 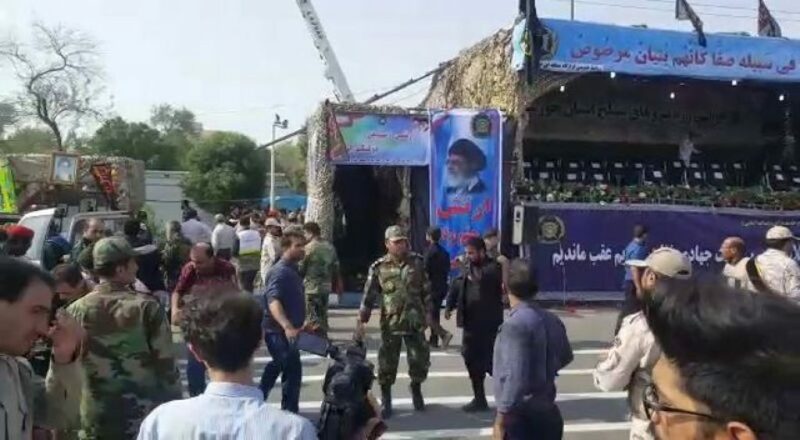 Amaq initially stated that a team inghimasis, or well-trained guerrilla fighters who immerse themselves in battle, struck the parade while Iranian president Hassan Rouhani was in attendance. Amaq quickly issued a correction, saying that Rouhani was not in fact in attendance. However, the Islamic State’s short claim has not been verified with supporting evidence. Various press outlets, including CNN and Reuters, say that another group, the Patriotic Arab Democratic Movement in Ahwaz, also claimed responsibility. A spokesman for Al Ahwaz movement issued a statement saying that his group distinguishes between military and civilian targets. But press reports indicate that children and other civilians were killed. The parade was held to commemorate Iran’s “Sacred Defense Week,” which marks the anniversary of the end of eight-year Iran-Iraq War. According to Iranian officials, the assailants operated like insiders, sneaking up on the marchers from behind. 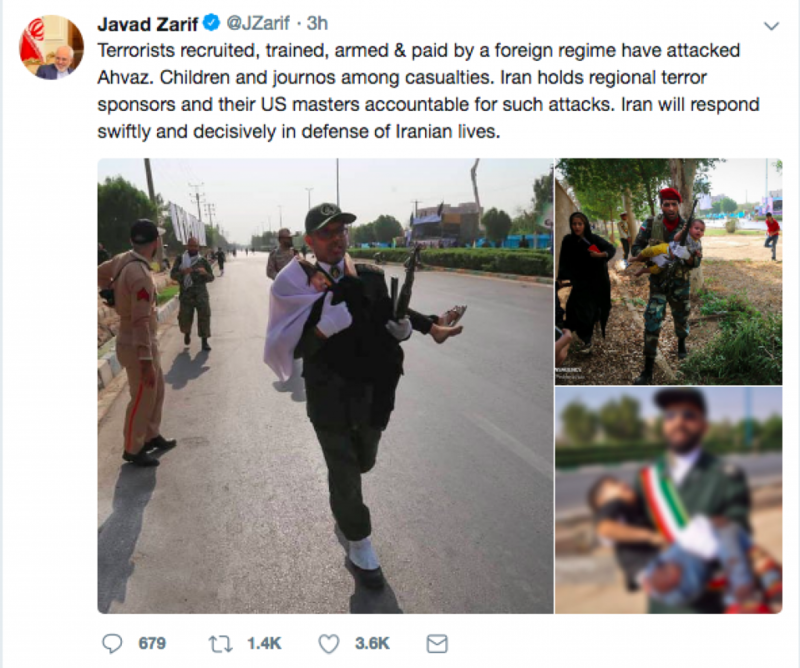 “The terrorists disguised as the Islamic Revolution[ary] Guards Corps (IRGC) and Basiji (volunteer) forces opened fire at the authorities and people from behind the stand during the parade,” Gholam-Reza Shariati, the governor of Khuzestan province, told Iranian media. The Iranian government has repeatedly portrayed the US as the puppet master behind the Islamic State and other Sunni jihadists in the region. Iran’s Supreme Leader, Ayatollah Khamenei, regularly makes this claim. In reality, the US has led a coalition of forces against Abu Bakr al-Baghdadi’s so-called caliphate since 2014. In fact, the US-led effort has benefited Iran in some ways, as the Iranians have expanded their footprint in Iraq and Syria during the war against the Islamic State. Although the Islamic State’s claim of responsibility has not yet been corroborated by other evidence, the group has proven that it is capable of striking inside Iran. The June 2017 killings were significant, because it was the first time the Sunni jihadists were able to launch a major operation deep inside the heart of Iran. Al Qaeda hasn’t directly carried out terrorist attacks in Iran, as the group fears that its facilitation network would be disrupted. Since July 2011, the US government has repeatedly said that al Qaeda operates its “core facilitation pipeline” inside Iran under an “agreement” that was negotiated with the Iranian regime. The Iranians have allowed al Qaeda to maintain this facilitation route despite the fact that the two sides are fighting each other in Syria and Yemen, and al Qaeda’s leaders routinely warn of Iran’s nefarious influence across the region. The Islamic State has bristled at the arrangement. In May 2014, Islamic State spokesman Abu Muhammad al Adnani rebuked al Qaeda’s leaders for prohibiting terrorist attacks inside Iran’s borders. “Let history record that Iran owes al Qaeda invaluably,” Adnani inveighed, saying he and his men had “complied with your [al Qaeda’s] request not to target [the Shiites] outside Iraq, in Iran and elsewhere.” Adnani, who was killed in an American airstrike in 2016, explained that the Islamic State was “acting upon the orders of al Qaeda to safeguard its interests and supply lines in Iran.” A file recovered in Osama bin Laden’s compound shows that al Qaeda did, in fact, issue such an order. The Islamic State did not adhere to these orders after it was disowned by al Qaeda’s senior leadership in Feb. 2014. And the group, which has fought against the Iranians and their proxies throughout the Middle East, finally lashed out inside Iran in June 2017. Again, the Islamic State’s written claim of responsibility for today’s attack in Ahvaz has not been verified by other evidence. *Note: FDD’s Long War Journal may update this report if more information on the group responsible becomes available.